Q. Can non-USC users have a library account login? 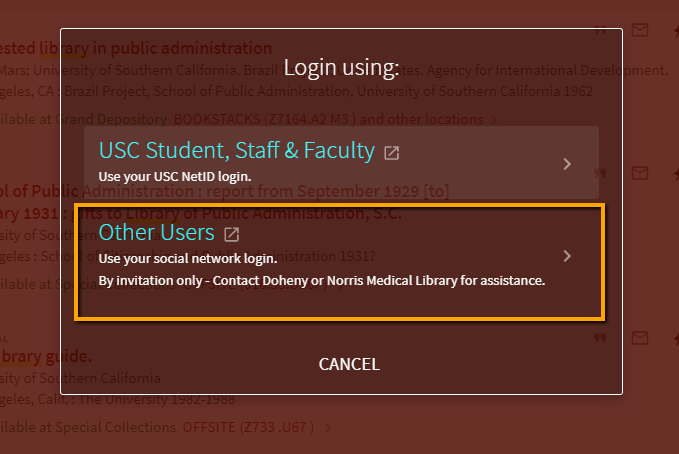 With a social network login, non-USC users with active library borrowing privileges (including alumni, Friends of the USC Libraries, fee-based borrowers, and other non-USC guests) can create and access their library account to check due dates, renew books, or page items from the Grand Depository. To complete the process, users will need to link their library accounts to their Facebook or Google profiles. Once registered, users should select the "social network" option the next time they're asked to sign-in for library services. USC students, faculty, and staff, should continue to login as they always have using their USC IDs and passwords. For questions about this service or for help, please contact the Doheny Memorial Library at dmlnotes@usc.edu or the Norris Medical Library at 323-422-1116.